Yesterday I spent 6 hours doing mock-interviews with Chris Roycroft-Davis, who used to be the executive editor of The Sun among other PR-related roles throughout his career. I was able to do 3 TV interviews and 1 radio interview – all fake, but all focused on how I would discuss Windows Live in an interview. I’ve done print interviews before (Times, Guardian, etc. ), but now I feel ready for TV and radio. I have no idea if I will ever end up doing a television interview, but it was fun to learn how to prepare for it and how to conduct myself during the interview. With no ability to stay in one location very long, Lorie and I have found a new place in London to live. It is in the Fulham Broadway area in a building that has a set of plants and palm trees in the middle. Our door opens onto this treed area and even the Royal Mail refers to this set flats as “Fulham Island”. Click on the picture to see a map of the area. We have been living in London for over 2 years now, and I’m still amused by the term "mind". In the States, we would say "watch", but probably have tons of other warnings to go along with it too. Alan’s recent blog entry reminded me that a little over a week ago, Milo and Daisy took Alan, Megan, and I on a 6 hour walk around Marlow, which is about a 45 minute drive from London. 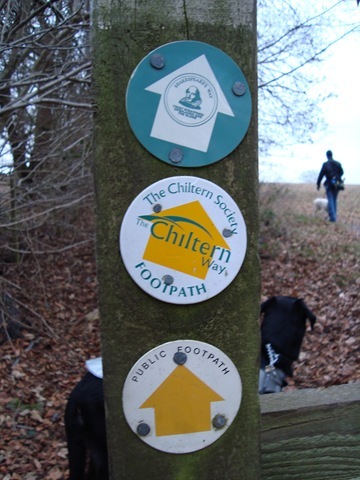 I already posted our photos the hike on the Chiltern Footpath; and yes, it was about 0c (freezing) the entire day. We got there in the MINI, which means it looked like this, but Milo instead of Elwood, plus me and my backpack. Yes, it was a little crowded, but not bad. To anyone looking for an easy hike in England, walking along any part of the 180 mike Thames Path is a great option.